Imagine. It is 1937. The Hook Continental is leaving shortly from London’s Liverpool Street station for Harwich, to connect to the night ferry to the Hook of Holland and the ongoing train deep into the heart of a dark, anxious Continent. In the Great Eastern Hotel, next to the station, a couple stand at the bar, drinking champagne before they board the boat train. They are romantic and mysterious. Who knows what fate awaits them on their secret mission into turbulent, troubled Europe. Whatever it is, they would never forget their last taste of England, that glass of vintage Dom Pérignon. It isn’t difficult to let your imagination wander where it likes to in the new Catch Champagne Bar and Lounge in what is now the Andaz Liverpool Street. So many dreamers, plotters and lovers have stood at its bars over the past century and a half. Much of the fine architectural detail in this C19th listed building remains largely unaltered. There is a sensitive and subtle overlay from designers Wilsdon Design Associates in the lounge, but our secretive couple from 75 years ago would recognize the original stained-glass windows and the elegant, vaulted ceiling. Today the boat trains to Harwich are a lot more prosaic, and any couple celebrating their departure with a glass of bubbly are more likely to be heading off for a weekend in Norwich, or a sojourn on the Suffolk Coast. More likely, though, they, or anyone else, are here just for that priceless experience of being in a place dedicated to the world’s most spirit-lifting drink. If you have something to celebrate, so much the better. But a crisp, well-served glass of champagne is one of the high points of life, in my opinion, to be enjoyed whenever and wherever somebody pours it for you. Catch Champagne Bar & Lounge was officially opened on June 20, 2013. The lounge is an appropriately intimate venue, with a discreet fireplace lit by a thin modernistic line of flame, and softly illuminated by two large chandeliers. A scatter of low seats and chairs are arranged behind wood frame partitions. The central feature is a charcuterie table with a vintage Berkel slicer as its centerpiece. Next to it is a communal table where guests may sip, eat, and unwind. Dedicated champagne bars are rare in this part of London. The nearest I can think of is the magnificently positioned champagne bar at St Pancras Station, right next to the Eurostar trains. 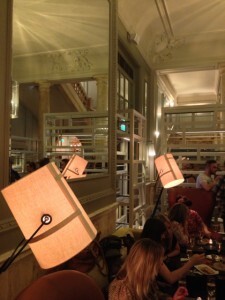 So the Andaz Liverpool Street is a rare and perfect place to gain an education into the king and queen of all drinks. There are about 70 champagnes on sale, as well as the bar’s signature Bellinis. As one of the sommeliers reminded me, this is no such thing as the cheapest champagne, only the least expensive. That, at £13 a glass, is the Veuve Cliquot NV. Or £58 the bottle. You would certainly pay more at Ascot. Prices rise to £440 for a bottle of Le Clos Saint-Hilaire 1996; and the pearl of them all, the Blanc de Blancs Belle Epoque 1999, at £650. The house wines include an attractively-priced Pinot Noir, the Wild South 2010, New Zealand at £9 for 175cl. Options on Sous Chef Sam Dunleavy’s “sophisticated comfort food menu” include Chorizo Pamplonica, Serrano ham, sliced gossamer-thin on the Berkel, and Salame di Milano. Take them on sharing plates and charcuterie boards, with homemade rustic sourdough bread brushed with fresh tomatoes and garlic, with olive oil, balsamic and caper berries. They can be served individually (from £6 per 50g) or as a board for two (£18). Sam also serves a variety of small plates, starting at £6. His highlights include Maldon smoked salmon with horseradish mousse and caviar; potted crab with country bread toast, and Asian braised pork belly. One of the bar deals is two glasses of Bollinger NV Rosé with a bowl of strawberry and cream for £35. A glass of Veuve Clicquot with three market oysters costs £16. And while you drink and taste, history and style is all around you. The Great Eastern Hotel, designed by brothers Charles Barry and Edward Middleton Barry, opened in 1884. It had secret places even then: there are two Masonic (freemason) temples—an Egyptian temple in the basement and a Grecian temple on the first floor. The hotel was transformed into the 5-star boutique hotel Andaz Liverpool Street in 2007. London architects, Wilsdon Design Associates, designers of the Catch Champagne Bar & Lounge, have been important players throughout the redesign. Stuart Wilsdon, CEO of Wilsdon noted the need for a “delicate balancing act of contemporary and tradition [in the listed building]; by mixing contemporary crispness with antique furnishing and earthier dark warm tones.” The same philosophy was applied in the Catch Bar & Lounge. Catch is open 7 days a week 7:30am – 11pm, and 9.00am on Sundays.